Today our long-awaited shorts (by me, anyway) go on sale. They are available in two styles: a clean, smart navy and a casual, garment-washed green. Although some PS projects have been more involved, this has probably been the longest to completion, beginning three years ago when I finally found a pair of shorts I liked, while travelling in Italy. In my view, most brands try to put too much style into the cut of their shorts. They are either surprisingly tapered, which is rarely flattering and often uncomfortable, or they’re big and wide, a traditional cut but again not one which suits many men. It’s hard enough to find shorts that fit, without resorting to styles that cling to big thighs or drown skinny ones. The PS short is a nice halfway point. A relatively straight cut, tapering slightly from the waist and ending in 4cm turn-ups. 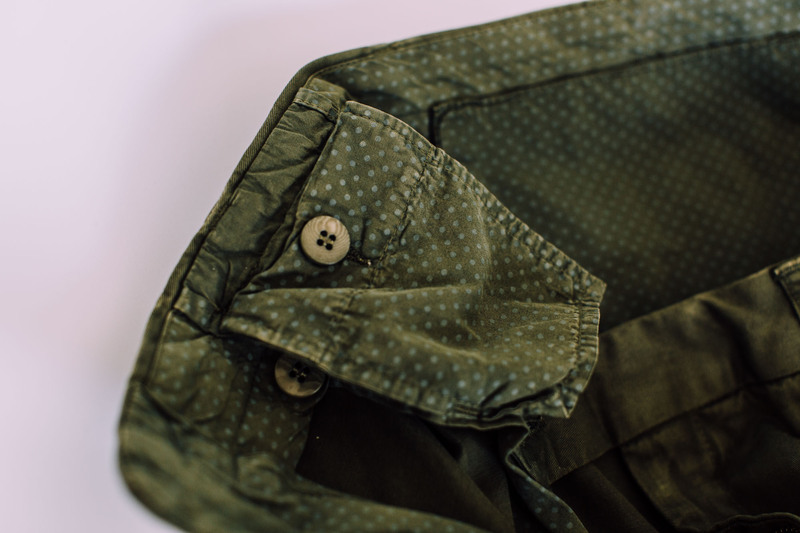 It’s details like those turn-ups - rather than the cut - that give the shorts their character. 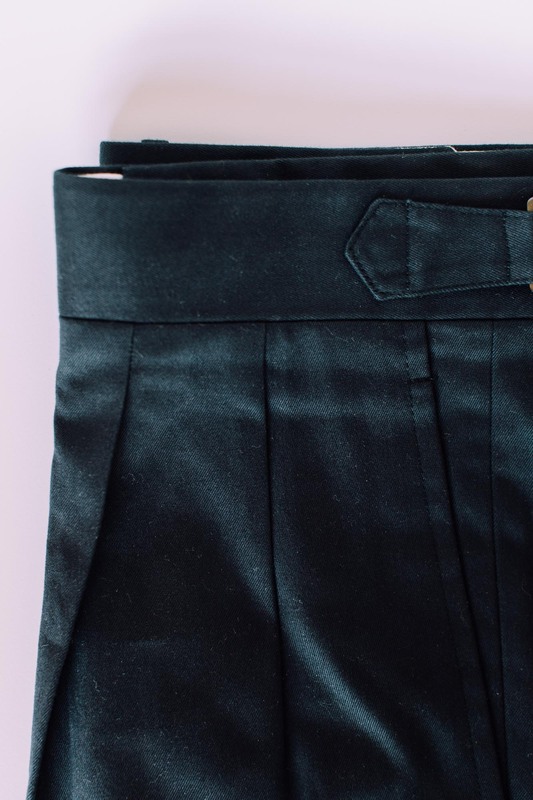 Both styles have two reverse pleats and the turn-ups (or cuffs), while the navy has side adjusters, horn buttons and an extended waistband. The turn-ups I like because they give a little width and strength to the leg, without trying to do that through the cut. They are also a nice sartorial detail, like the pleats. I usually don’t wear pleats, but these are shallow, adding only a touch of fullness (helpful with a large seat, like mine) without making the top half bulky. 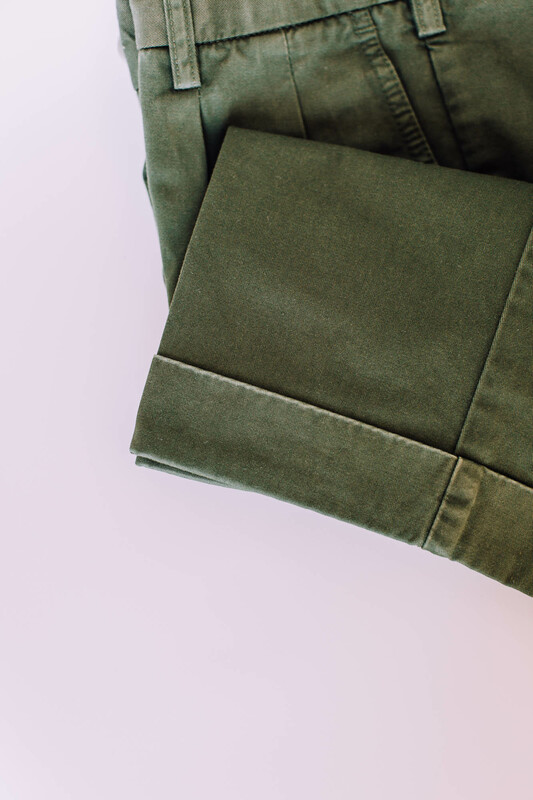 I’ve tried the shorts on a few friends, and it’s interesting how the pleats help fit a greater range of body shapes - something particularly helpful when buying online. The two styles are made in the same mid-weight cotton, but the green is garment washed to give it a more casual look. I find this means they can span a wide range of formalities, from a shirt and loafers to a T-shirt and trainers. 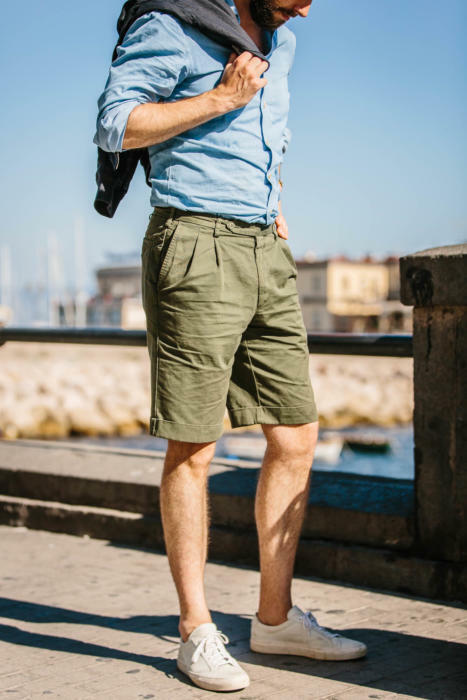 They're shown above with a grey Friday Polo and canvas trainers, but also (at top, in Naples) with a denim button-down shirt and linen blouson. I wouldn’t wear either with a jacket, but the navy in particular can be pretty smart. 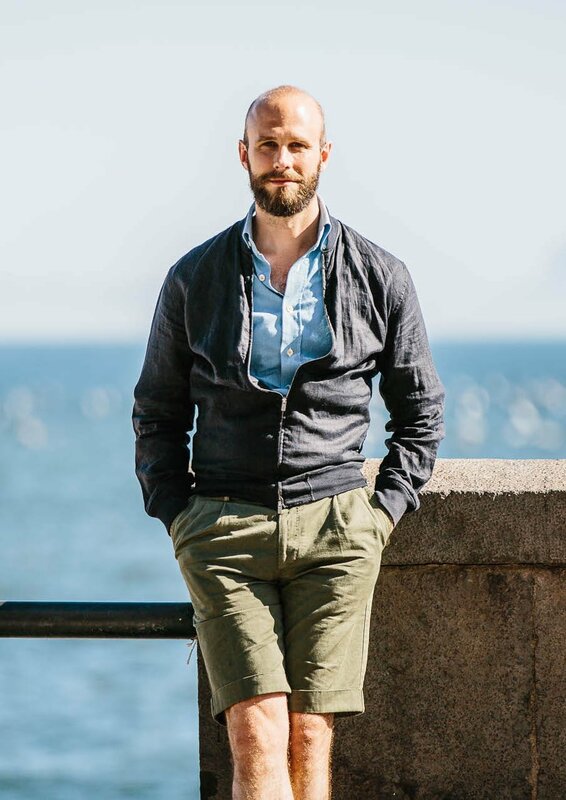 Above it is shown with a linen button-down shirt from D'Avino, a Luca Faloni cable-knit cashmere sweater and Edward Green tobacco-suede loafers. 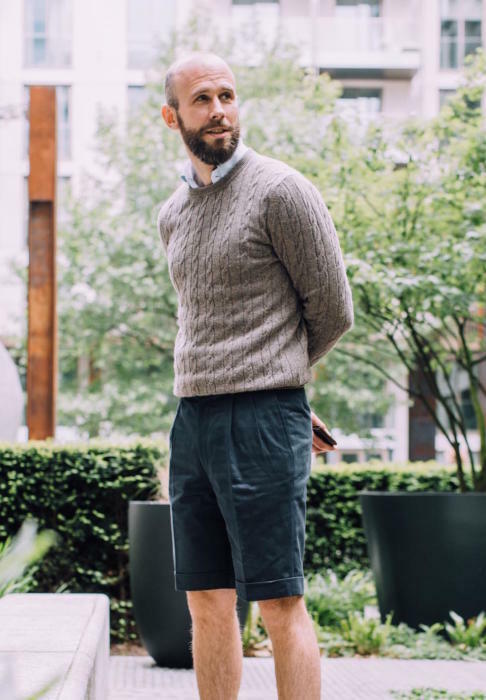 It might seem odd to show knitwear with shorts, but this is often what British summers are like - even on warm days, it can be cold in the morning and in the evening (as it has been the past two bank-holiday weekends). I also find the navy works really well with knitwear-like polos, such as the Aspesi I featured recently. 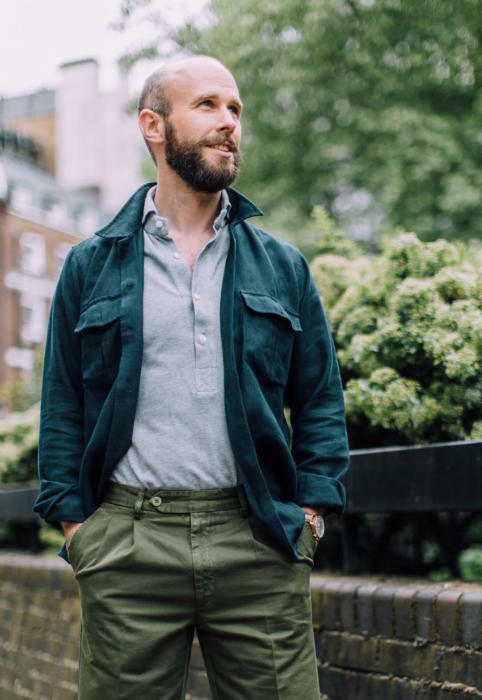 I would usually wear the green style with a belt - certainly if the shirt or T-shirt were tucked in. I haven’t shown them here with a belt just so readers can see the design uninterrupted. As well as the different style elements on the outside, the navy and green are finished differently inside. The navy has a shirt-fabric apron around the inside of the waistband, as on tailored trousers, while the green has a self finish and interior pocket. 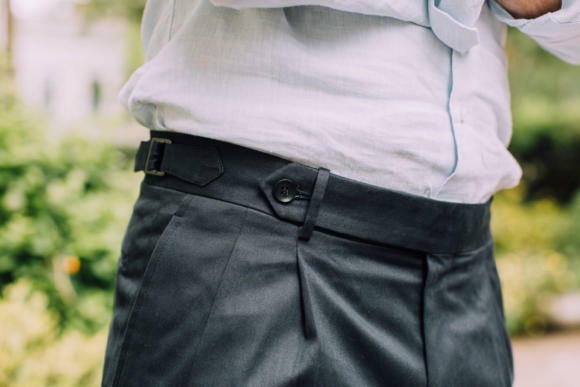 Both have a coin section inside the right-hand pocket and one rear pocket on the right, fastened with a button. The shorts were made by Italian factory Rota, who readers will probably be familiar with and make for several other high-end brands. 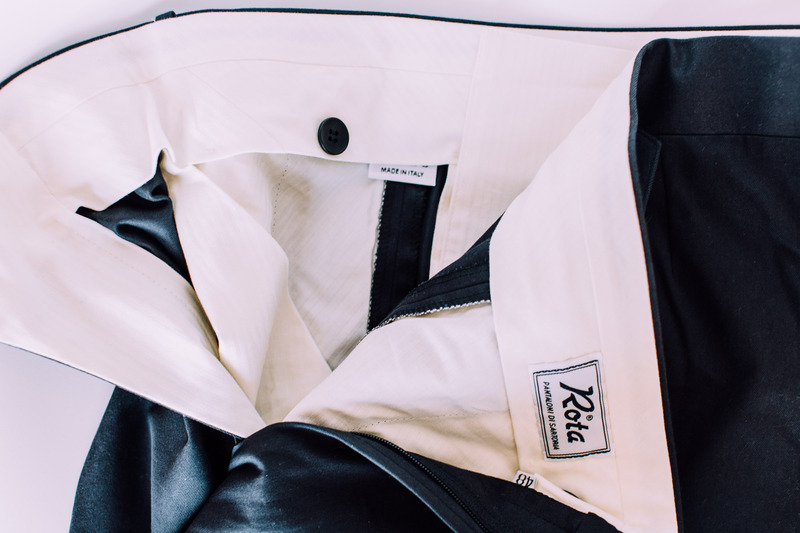 The make is a good level for ready-to-wear, with great hardware, linings, buttons, and finishing. A machine make, but with a high level of precision. The shorts are available in four sizes: small, medium, large and extra-large, equivalent to Italian sizes 46, 48, 50 and 52. Do also remember that we offer free returns if the fit doesn’t work. Contact support@permanentstyle.com to arrange a return or exchange. Full measurements are below. As with other pieces, we recommend comparing these to something you already own to get the best idea of fit. I wear medium (48). Both shorts can be taken in considerably at the waist, by 5cm (2 inches) at the most. It helps here that there is only one rear pocket, as large alterations won't push two pockets oddly together. On the green shorts, such a reduction in the waist would also require the rear two belt loops to be taken off, and reduced to one, over the back seam. The navy can also be taken out in the waist, by at least 3cm (1.25 inches) as there is considerable inlay there and running down the leg. However, the green cannot be taken out as this would leave lines around the old seam (as they are garment dyed and washed). Both shorts can be shortened in length, at least by 5cm (2 inches). The bottom of the leg is obviously smaller than the thigh, but there isn't much taper at the bottom. At the worst, the leg might need to be narrowed slightly as well. The green pair, however, would require the turn-up to be cut off and machined on higher up, as again there are fade lines at the top and bottom of the turn-up. They should be washed cool, at 30 degrees, and hung to dry before ironing. Price (£175) does not not include VAT, as most PS customers live outside the EU. Taxes are added at checkout. I'm so excited to have these shorts on offer, given how much I love them and get out of them. Do let me know if I’ve forgotten anything, or you have any questions. You can follow the discussion on Introducing: The PS Shorts by entering your email address in the box below. You will then receive an email every time a new comment is added. These will also contain a link to a page where you can stop the alerts, and remove all of your related data from the site. Finally there are here! May I know what the inseam of the shorts is? Thanks! Is it possible to give the inside leg measurement? I assume what you’ve given is the outside leg which is inevitably impacted by the rise. Sure, I’ll check that now. I’m 6 foot tall, so not a big difference. I’m also confirming the extent they can be altered, including shortening. This is easy to do a bit obviously, but too much and you can’t deal with the taper. How much can it be shortened? And can you provide the shortening service? Out of interest – where do most PS readers reside? And have you noticed a change in readership over the years, as the tides of economic fortune slowly shift to different parts of the world? No, it’s been fairly consistent. A slight rise in Chinese readers and from south-east Asia, but the majority is still from the US, followed by a chunk from the UK and then a few other countries like Australia, Sweden and France. They almost have a WWII British Desert Ray style to them. Quite like these, but would prefer in a good linen. Not sure about longer extender on the navy, and don’t quite understand why the inside leg stays the sane whilst the outside gets longer with increasing waist size. And much as i would love to, i cant like plimsoles on older people as a casual shoe. It’s a bad look, but your suede ones look fantastic. 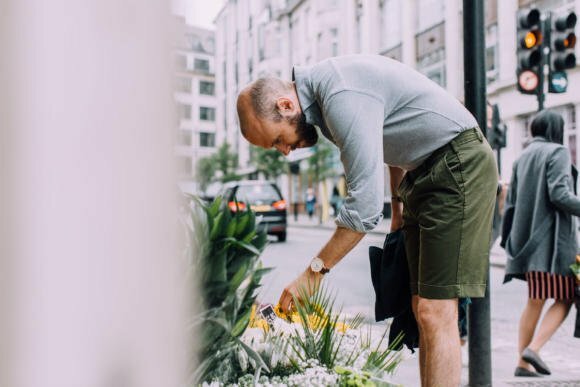 One thing I didn’t mention in the post was that I generally prefer cotton shorts as I wear so much linen above the waist in summer – whether that’s a linen shirt, overshirt, or anything else. Usually (but not always!) nicer to have different materials there top and and bottom. Luca Falioni does some nice linen shorts (in larger sizes too). These look fantastic — great work all around. I use uniqlo. Not fancy, but they are what I need. They even have little grips for the back of your heel. Thanks Hugh. I did buy some Uniqlo ones recently but they weren’t low enough. If you have the model of yours, do let me know. Falke’s would work. Funny to talk about sock “rise” but it really does make a difference. I’ve purchased plenty of pairs that show far too much. For US customers, smartwool is also pretty good. Great shorts! Can size 46 fit a 28-29 waist? That should be about right, yes Tim. I do suggest comparing the measurements to a pair of shorts or trousers you already own, however, as this will be far more accurate. A size 44 would fit a 28-29 waist. Unfortunately, they aren’t available at this point. Hopefully, Simon would be able to do a run of them. I have been waiting for these rather eagerly, they look great! Unfortunately I can’t order them as only CC is accepted as payment and I don’t have one. Is there a way to use either PayPal or the good old bank transfer instead? We’re still joined by EU bank laws so the latter is quite easy 😉. Interesting. Paypal is certainly expensive but do you get hit with fees with the platform you use there as well? You mean the shop platform? That’s Shopify, and yes you do but they’re much lower, particularly when you get to a decent volume. The kicker on PayPal is always those fees for getting your money out. Both shots with the shirt only tucked in are very nice. As commented on the PS Oxford Fabric – it works well on you. I am also using Falke ‘Invisible Step’ they are by far the best for me,. Fit, functionality, durability and even price. Since more than a decade my ‘secret’ armory for summer. Falke’s are a disaster just dont stay on and quite expensive, I tried lots and found “Next” to be a clear winner. These are nice shorts but wearing shorts should not be encouraged. No item of clothing better symbolizes the tragic state of male elegance than shorts. Once upon a time, not too long ago, they were not worn in cities, certainly not in the evenings and not to go out to dinner. These were the rules, even, believe it or not, in warm places like Rome . But we got fatter and fatter, with people now obese at a rate of 40%, and now shorts are all some men wear when the temperature reaches over 15 degrees. I am against them except for when on beach vacations. They make men look like boys. I remember reading years ago that the Bermudan diplomats eventually gave up wearing their beloved shorts when away on business. Apparently nobody would take them seriously in meetings. Imagine wearing shorts to the UN! But then, I live in shorts May-September. It’s all about context. Personally, I don’t think there’s anything wrong with wearing a pair of clean (i.e. 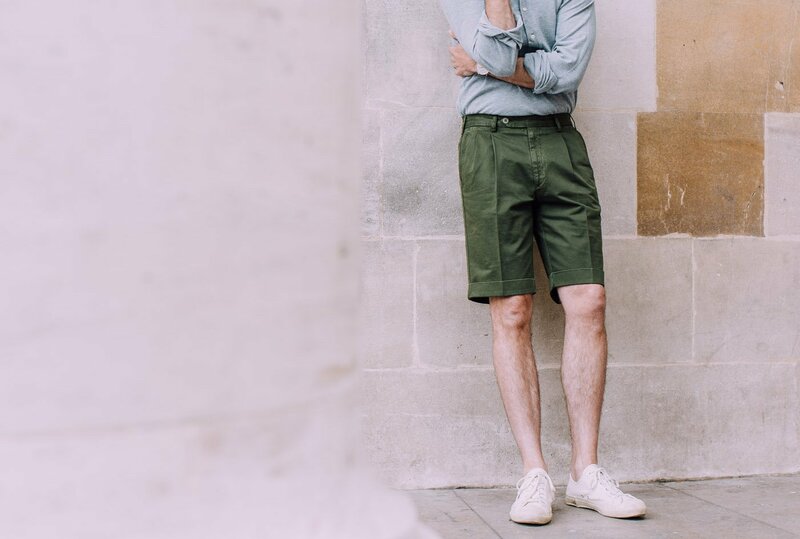 not the ones you’ve been sat by the pool in all day) cotton or linen shorts, along with a oxford shirt and suede loafers, to a casual dinner at a restaurant in the evenings. If it’s a question of elegance then which do you find most egregious to delicate sensibilities – the site of a man in shorts or the prospect of eating your dinner next to a man who’s wearing a shirt, tie and blazer, but who is also sweating like a long-distance runner? The extended tab closure with visible button seems to be gaining popularity, presumably you chose this for stylistic, rather than practical reasons? Also the suede loafers are EG Piccadilly? Yes, there’s no functional benefit to having it longer. Wow, these look really awesome. I so like them. Given i come in at a 35 waist, should i go up or down? Which way will the straps take best? Can’t call yourself a cyclist with hairy legs. 🙂 These are nice, glad you didn’t make a khaki version, it’s overplayed in the US. The right shoes for dressier shorts is a tough choice, hard to pull off. I’m normally birkenstocks which I know is horrible but boat shoes if I have to be moderately presentable. Not sure about suede loafers. Agree Rafael. Definitely not trainers though. That is a really bad look. I do like the loafers. Other options would be suede or leather driver’s shoes. I usually wear my shorts slightly shorter and slightly narrower in the leg. These do look nice though. Maybe a more urban sartorial look, rather than beach/resort wear. I am a little puzzled by the pictures. The green shorts look nicer to me in the pictures with BD shirt rather than the polo shirt. Is this really the same? Looks lighter more faded colour in the pictures with BD shirt, even allowing for the sunlight in those pictures. Hi Simon. I read your blog for fun and info even though I’m female. Would you (or anyone here) happen to know of a great blog about luxury wear for women? Thank you! Afraid not, but lots of people do ask. The problem is not really that there aren’t blogs about it, but that there aren’t the makers to really support writing a blog about… Had a long conversation with two women in HK a couple of weeks ago, about trying to find decent dressmakers, for example, anywhere in HK or CHina. 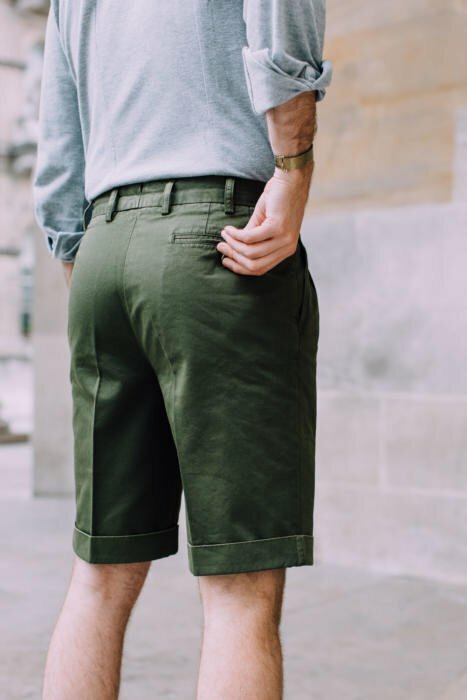 Are these shorts really worth more than twice the price of the beautiful linen/cotton shorts Luca Faloni is carrying this summer? Well, there is quite a big difference in terms of the make. Rota as we’ve used here put a lot more into the shorts, more akin to a trouser, while Luca’s are quite simple. Still nice, but a bit more of a beach short (something Luca and I in fact discussed). But I suppose my point is more about practicality in use. If I’m wandering around Toarmina, having a coffee in a café in Padstow, or strolling through Florence in summer looking at the architecture (all of which are things are likely to be on my agenda) is it worth the extra, or should I save the money and use it to buy my lunch? It just depends how you want to dress. If you want something you might tuck a shirt into, and look that much smarter, then go for these. Like the difference between a trouser and a draw-string pant. Both pantherella and falke work well, with a slight preference for the former. Just received the shorts in green. The halfway point (between the taper and being big and wide) as you describe, is something that is so difficult to find in a pair and these manage to get it spot on. Thank you. Cheers. Surely its about the size of your leg, rather than Simon getting it spot on? Hi I am a 36 inch – what size would work best? Looks like the green is a lot more casual looking with the navy a more formal look perhaps – inclined to the green but the touches on the navy are very nice! The navy one has redish-brown buttons and the shirt-fabric apron of the waistband is a navy bengal-stripe though. The green one is as on the pictures. Thanks Christos – I’ll double check the stock on those two points. Just received mine as well. Same striped apron as Christos. Yes, the apron is my mistake. I had forgotten we changed it from sample to final production. Luckily I think the stripe is nicer! 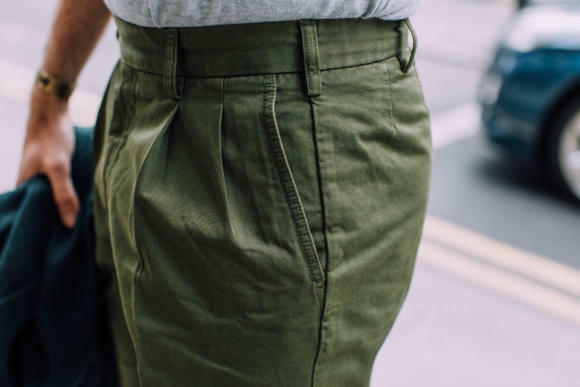 Is it possible to let out and widen the width of the shorts through the leg (for the olive green version)? Purchased the green shorts a while ago and am really happy with them, thanks! Will there be a restock of the navy model (this season or ever)? I particularly like the non-skimpy turn-ups – hard to find these days! Regarding Colour: The mid green is quite colourful and not as subdued as olive would have been. Maybe a darker shade would be easier to harmonise, but certainly would not be as summery. I received my green pair today in size 46. The fit is more or less perfect. I often have problems with RTW trousers not fitting well in the back because of my (in contrast to Simon) not quite so prominent seat. These have no such issue what so ever. I’m really happy with them. For reference, I’m 176 cm (5’9”) and on the slimmer side. Simon, great post as always. Just out of curiosity, I see that the shorts you picked are just a few inches above the knee. What are your thoughts on shorter “formal” shorts? thinking something like the length of the bulldog orlebar brown swimwear. I like smarter shorts – and the navy ones here were meant to be something more like that. Personally I think that shorter ones look best as swimming trunks. Particularly when sitting down. An inch or two above the knee is ideal. Was there any particular reason you considered a shorter short to be more formal? To be honest, I did not have any clear position on that. I guess I tend to proxy long shorts with boarders, cargo shorts etc. so I leaned a bit towards the “short” side but that’s why I wanted to hear your thoughts on that. Pictures definitely look very good and I think that a shorter short might work with a polo shirt but not sure you could pull it with a shirt the way you do it on the photos. 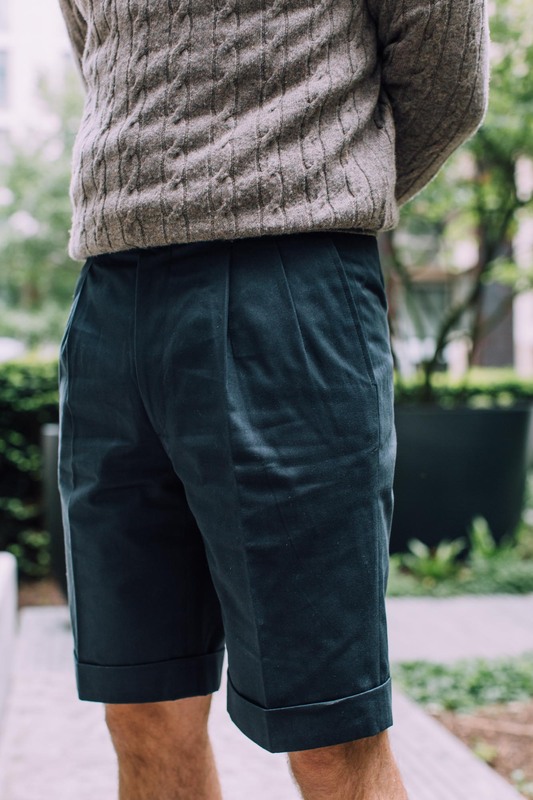 …just for me to understand it right … so you mean that when standing the length just above the knee is appropriate for more smarter shorts and that when sitting down this length moves an inch or two above the knee. Right?